I picked up this new Fantasy Flight Game a week or so ago and finally got it onto the table last night. 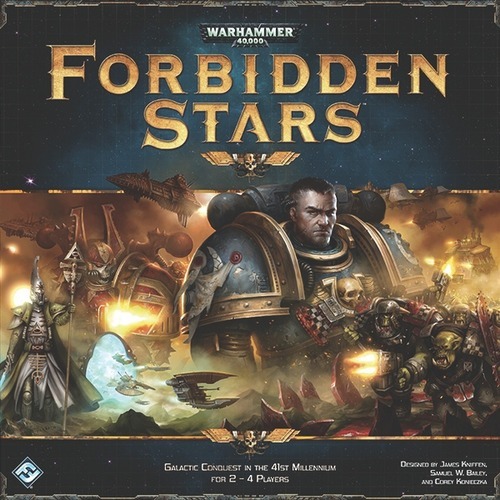 There was just two of us playing so we tried out the Space Marines and Chaos Space Marines. 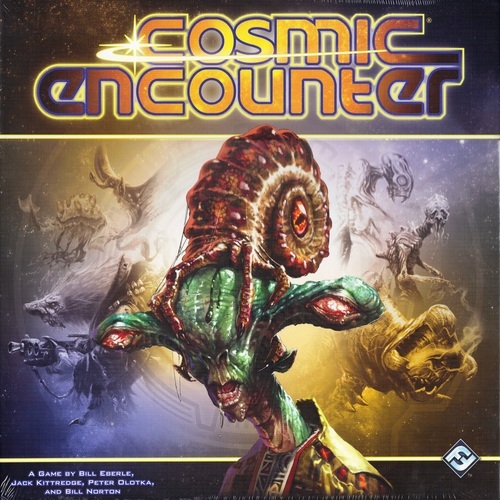 In this game you build up your forces and planets and try to conquer numerous worlds and capture objectives. Each world gives material (with which you build everything) and certain bonus items that can let you build powerful units such as Titans and large warships or build units for reduced cost. The heart of the game are the Orders. Each player has 8 orders and they place them in a system where they want to do something. Other players can add orders on top of your orders, so certain systems can end up having a stack of orders on them. Orders are actually carried out from top to bottom, so you have to plan ahead to figure out the sequence that works best for you. The four factions that come with the game are the Ultramarines Space Marines, World Eater Chaos Space Marines, Evil Sunz Ork clan and the Eldar of Craftworld Iyanden. Each faction has it's own units and own set of cards that reflect that races abilities. As it was our first game it took us about 3 hours with my forces of Chaos triumphing over the Imperium scum. The game is for 2-4 players and I could see a 4-player game taking a good 3-4 hours. 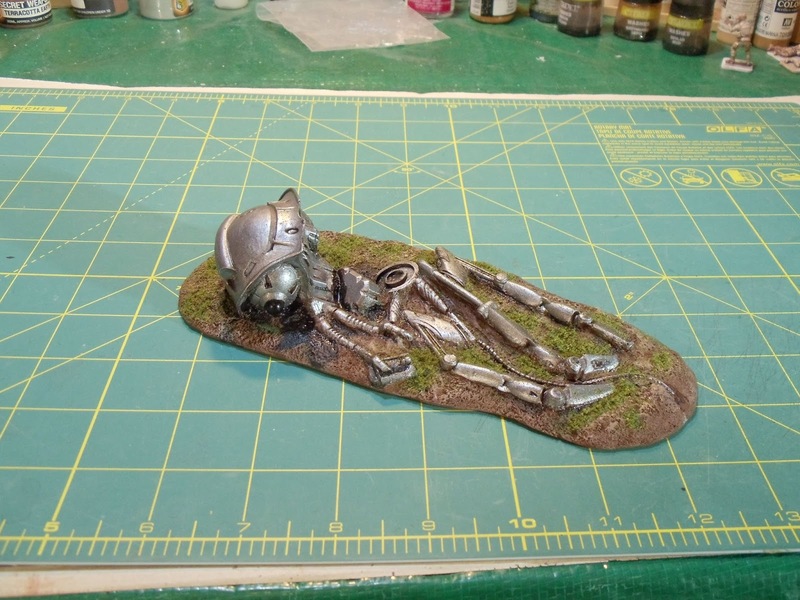 As this is a Fantasy Flight game, the components are of course top notch. 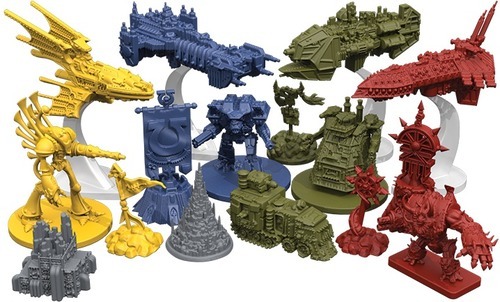 Also as this is Fantasy Flight, they will probably be a few expansions covering the other factions in the 40K universe. I got together with some friends last night to try out some new games he purchased. First up is Cosmic Encounter by Fantasy Flight Games. I've been wanting to try this game for a while so I was quite pleased my friend picked it up. In this game you are a race with a set racial ability. Your objective is to settle 5 colonies on other player's planets. Every turn you have to launch 1-2 different attacks. Each player has a hand of cards with which to attack/defend and do an assortment of other functions. The game really shines in the variety of different races you can play and how they interact with each other. We ended up playing 3 games, with each game running from 1-2 hours each. The other game we tried out was The Manhattan Project from Minion Games. In this game your objective is to be the first player to get to a certain number of points and to do this you need to build nuclear bombs. Not use them, just build them. The basis of the game is placement of your meeples much like in Wizards of the Coast's Lords of Waterdeep game. You start out with simple labourers but you can get engineers and scientists. 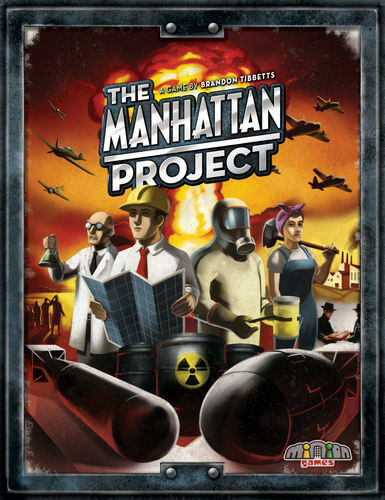 With these you can construct buildings like mines, universities and reactors, you can create plutonium and uranium, you can build fighters and bombers (with which you can attack the other players). But to get points you have to build plutonium and/or uranium bombs. It's not really a game for pacifists. It's a fun little game but it actually takes a while, there was 3 of us playing and it took a good 2 hours. 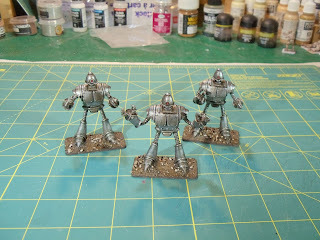 Last night I finished up my figures for the Retro Raygun Robot Legion. 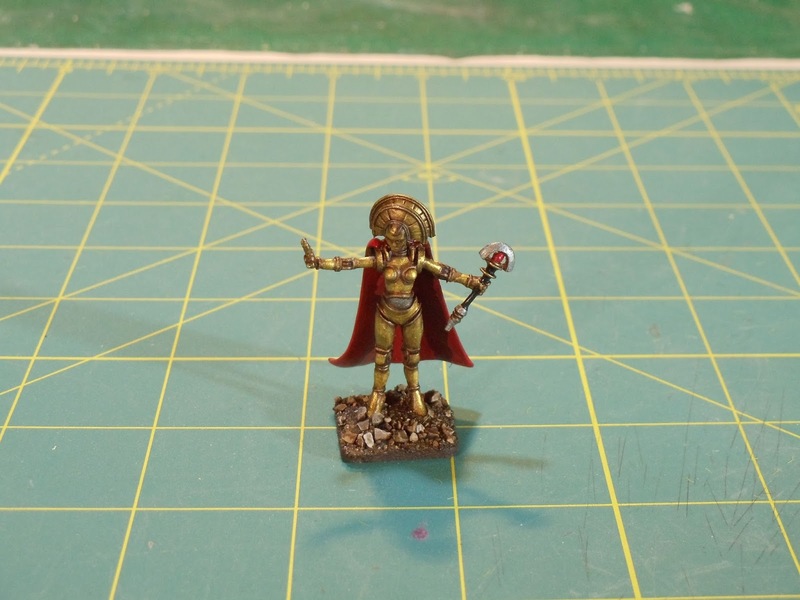 Figures are all 28mm Hydra Miniatures with one exception outlined below. 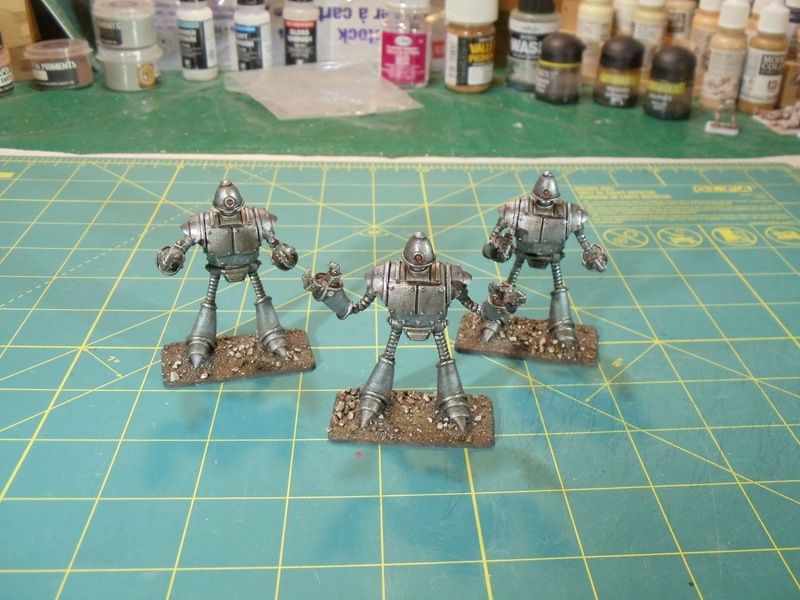 First up is a trio of Warbots. 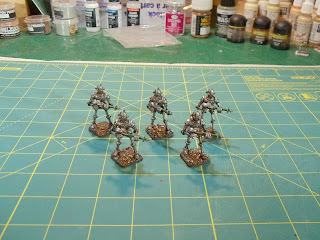 Next is a squad of Robot Legionnaires. This next group is the exception mentioned above. 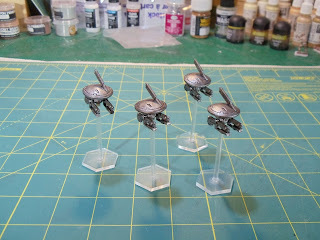 These figures are GW 40K Tau drones mounted on Litko bases. They fit quite nicely with the rest of the Robot Legion. And finally is Queen Mechanika. 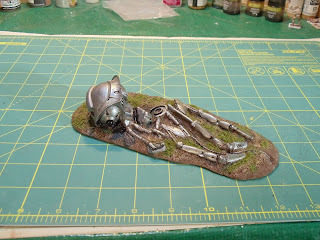 I also managed to complete a couple terrain pieces for All Quiet on the Martian Front. 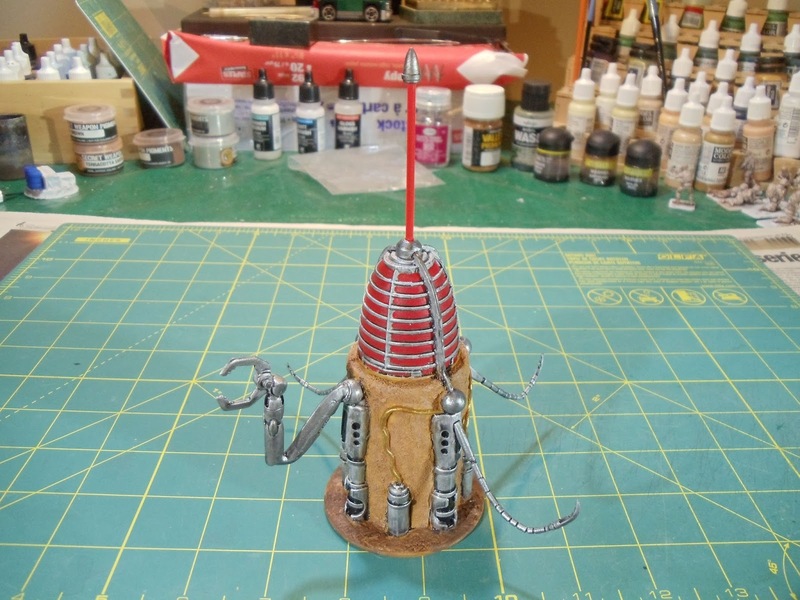 First up is a downed Martian Assault Tripod. 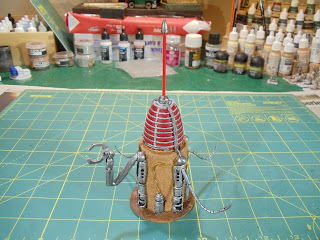 And finally is a Martian Power Node. 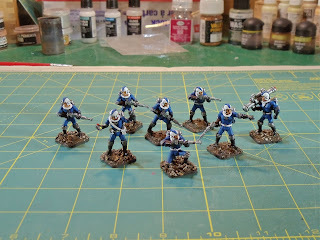 On my paint table next is a couple bases of samurai for my long-running Impetus samurai project. Yesterday I finished up a group of figures for Retro Raygun, Hydra Miniatures new pulp sci-fi ruleset. These figures are for the Galacteer faction. First up is a group of 5 Galacteer troopers, an Engineer, a Sergeant and a trooper carrying an Atomic Bazooka. 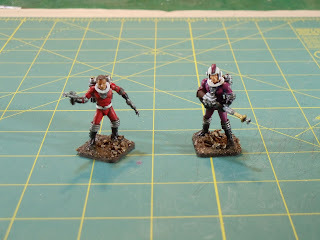 Next is a pair of heroes, on the left is Ace McGuire and on the right is Rocky Rizzo. On my paint table right now is a group of Robot Legion figures and some Martian Front terrain.